Probably not a shocker, but interesting to see the data, it appears the average ABV across a given beer category does increase the average beer score for that particular category. A few noticeable outliers are goses and berliner weisses which tend to score high despite their low ABV, and American malt liquors score low despite their relatively high alcohol content. 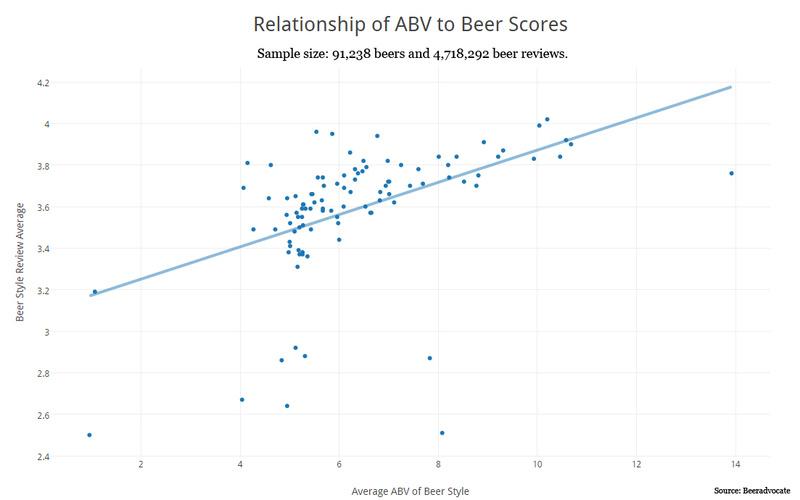 The chart below shows Beeradvocate’s average rAVG score for each beer category (essentially the average of all individual beer averages for each beer category) in a scatter plot with the beer category average ABV. Great work and outstanding initiative. Looking forward to playing with the data. Trahanache Posted on De martea viitoare s-ar putea sa nu mai aiba treaba! De parca pana acum ar fi facut prea multa… Oricum, baloanele guvernarii PDL s-au fasait demult ori au scapat dezlegate. you are really a good webmaster. The web site loading speed is incredible. It sort of feels that you are doing any distinctive trick. Also, The contents are masterwork. you have done a excellent activity in this topic! for the most part, the alternating POVs worked. The Scorpio Races is a near flawless book IMO so it’s hard to compare the two. TRB is just not as tight overall.